Hello there! Blimey, haven’t done one of these for a while, so thought I would share what I’ve been using this week face-wise. I’ve actually been a bit AWOL ‘on the blog’ for a couple of weeks due to an exciting new job but I’ve got plenty of new and exciting stuff coming in the June pipeline, so do stay tuned for all that. 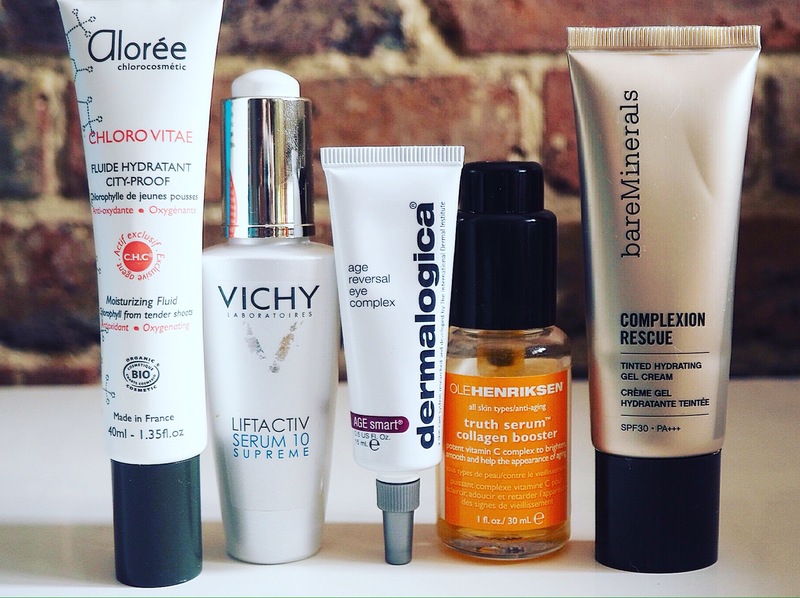 In the meantime here’s a run down on my daytime skin essentials at the moment. Using 2 serums #gangsta the lovely fruity Ole Henriksen Truth Serum on my face and a bit of Vichy Liftactiv on neck and decolletage. AND I am really LOVING this new moisturiser from French range Aloree I totally recommend you try them out. The active ingredient is chlorophyll (cast your mind back to biology lessons) which oxidises and increases skin cell renewal. It’s even thought to increase our natural barrier to UVB rays. The whole range is certified organic, free from chemicals, preservatives, parabens and other nasties and is made in the Languedoc region of France in a sustainable and eco-friendly fashion. Plus it smells incredible. Like swimming in a chilly pond full of algage (but nice!) and their face masque looks like something a mermaid might sneeze into her hankie. (Am I selling this to you?) Trust me, investigate. I love the daily moisture fluid and next up to try is their CC cream. Until then though I’ve got my trusty Bare Minerals Complexion Rescue for a nice glow and that all important SPF. This really is a staple product. So nice to have a daily SPF which is not chemical based. Lately I’ve been really concerned about the amount of chemicals we’re slathering on our largest organ (our skin, yo) on a day to day basis. Complexion rescue is a way you can protect yourself from the sun but avoid a chemical sunscreen so really is a winner in my book. Plus it makes your skin look fab. Hope you’re all enjoying your holiday weekend so far and happy half term to all those with kiddies. No more school runs for a week. Bliss. See you soon, for a vlog, a very exciting skincare event, an interview with a new skincare mover and shaker and lots of other fashiony, beauty and fitness bits and bobs.